Still no idea what to do on Christmas? Celebrate the soft opening with futurehippie and be one of their first guests. This can be an escape from Christmas or a holidays with like-minded people. They will open their doors on December 24, and from then on they will be be an ongoing yoga retreat center in Koh Samui. Rayk and Mika can't wait to celebrate with you! The accommodation will be in basic bamboo huts. futurehippie will open their doors on December 24 and hope that you can plan your arrival until 4:00 p.m. At 4:30 p.m., you will have your first official yoga classs at futurehippie. It will be a gentle class to settle in. For Christmas Eve, there will be a special vegan dinner at 6:00 p.m. After that, you will have a ceremony and sharing together. Christmas Eve is a special day (in Germany, this is usually the most important day of Christmas) which you usually spend with your family. Many people don't have families anymore or are just tired of these holidays. Whatever reason you have, futurehippie would love to welcome you into their family and celebrate this time with like-minded people. From Tuesday to Thursday, there will be always a morning flow at 7:30 a.m. and an afternoon practice at 4:30 p.m. On Tuesday and Thursday at 7:00 p.m. there will be a meditation class or an activity, as well. When you do leave, on Thursday, you can still participate in the program for the whole day. Two yoga classes a day (7:30 a.m. and 4:30 p.m.), meditation and community classes, usage of the co-working area for digital nomads, and, of course, usage of all facilities are all included. Mika has been practicing Hatha yoga since 2015. She completed the following yoga teacher trainings: 200-hour Hatha / Vinyasa yoga, Shades of Yoga, Bali; 100-hour myofascial Yin yoga, Beta Lisboa, Bali; 36-hours Fly High Yoga, Gili Trawangan; 300-hours Hatha yoga, Yog Peeth, Rishikesh, India. She taught in Bali, Gili Trawangan, Germany, Spain, India, Cambodia, and Malaysia under her first label “Mika-Yoga”. Since autumn 2018, she's the co-founder of futurehippie. Rayk comes from the world of finance and procurement. He has experience of more than 15 years in both fields. He fulfilled his wish to work more with people – besides managing a team at work – with getting life coach in September 17, after three years of education based on Gestalt therapy. Rayk has been practicing yoga and Pilates for 10 years, as a perfect equivalent to his others sports like spinning, crossfit, and running. Now he likes to share his knowledge of how one can realize a mindful way of living nowadays. Vegan breakfast and dinner are included in the package price. Lunch, snacks, and coffee are available at the vegan cafe on-site. Please book your flight to arrive at Samui Airport (USM). Transfers from and to this airport are not provided. It takes around 60 minutes by taxi to get from the airport to futurehippie. Costs are around 700 THB. 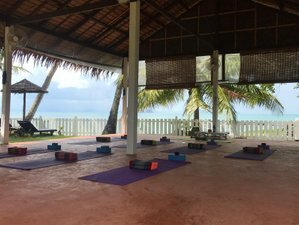 Welcome to futurehippie, a modern yoga retreat center on the beautiful island of Koh Samui!